We delivered a clean and eye-catching design which gives the pack the shelf presence required to attract potential buyers. 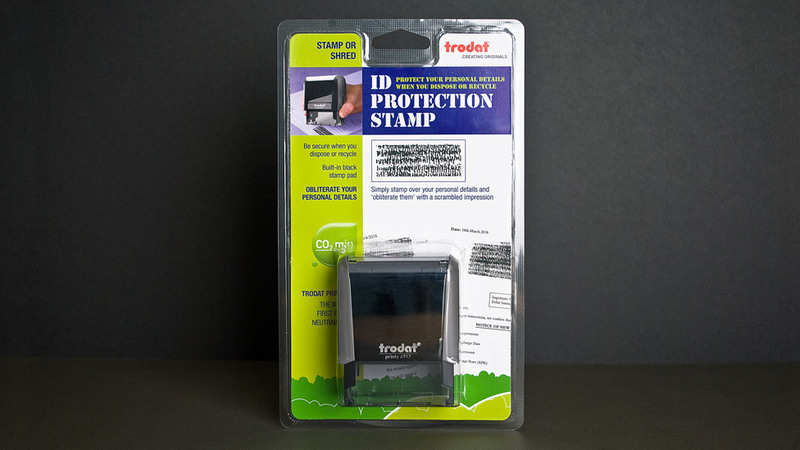 Trodat, in an effort to reduce packaging costs, decided to implement the use of blister packs and approached Parker Design to produce the blister pack card design for their innovative ID Protection Stamp. The ID Protection Stamp removes the need for shredding sensitive material such as bills or bank letters. The stamp is designed to overprint the address with a mix of scrambled letters and numbers that disguise the original information. The blister pack card design needed to reflect the environmental benefits, simplicity and convenience of using the stamp. Green tones and shapes, and recycled content within the stamp itself hint at the environmental aspect of the product. The use of a simple image to show the stamp in use also helps to quickly show buyers the benefits of using the product. The final blister pack card design has a clean eye-catching design which gives the pack the shelf presence required to attract attention. “Parker Design are a friendly team of committed and reliable designers. They always listen to what we need and their creative ideas demonstrate a genuine understanding of our business and our customer base. Tru needed the help of a design agency to promote their new snack bar. With clever graphic design ideas we made the product jump off the shelf. Carton packaging design is an extremely powerful aspect of how successful a product's appeal is to its target customer. In the case of Trodat's market-leading stamp products, it was vital we display the technical specifications and physical attributes of the office equipment.